Stop complaining guys. This is all for the spirit of fun. Happy anniversary ya'll!! Give us the option to pick costume or regular classic hat and we got a deal. ... I think the hat is cute. 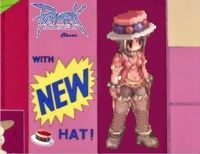 But........ "The hat is new"
When I heard the hat was a Raspberry Mousse Hat I really thought it was a cute dessert hat. If I can ask, why you guys decided change the prize? The Classic Hat was worth venturing into Classic, but the Costume: Raspberry Mousse Hat ... yuck. The Classic Hat has better colors than the Raspberry Mousse Hat, which do not match any classes afaik. so i lvl a char in classic and then i get the costume in renewal is that right? i just need to post screenshot here when I get 99 (non-trans) right? and then, what should i do to get that hat? Can you match it with Costume: Smile Mask and make an awesome combo effect? As for the cursed gear quest, it requires quite a bit of movimentation between cities, and if someone is starting from the very scratch, its very probable they wont have the zeny for the initial teleports, as from what i saw it just gives tickets to you in the Al de Baran part. Even with the free 5 tickets from training ground completion, you must not have used a single one until then, not do any wrong teleport, use the prontera warp scrolls everytime in between just to not consume tickets, not to mention know wich city you can go from another( Al de Baran from Geffen for example). So giving like 2 tickets(3~4 on the Al de Baran part) on each part of the quest i think would be very nice. The problem is that the color looks feminine. At least the Classic Hat looks gender neutral. Allright, I was able to find a costume version of the classic hat, so we'll have that as the free hat for this promotion. One thing you can use is the 1st class warpers in the Asgard Village. They are on the left side of the map and will warp you to the job change towns for free. And the Classic Hat received from Cover to Cover contest, will it be changed into something else? This new free costume is basically a greater version of the prize.